Linux Mint 13 Cinnamon and Linux Mint 13 MATE are the latest editions of the popular Linux desktop distribution based on Ubuntu Desktop. This tutorial presents a step-by-step guide on how to dual-boot either one with Windows 7 on a computer with a single hard drive. Because the Cinnamon and MATE editions of Linux Mint 13 share the same installation program, the steps involved are the same regardless of the edition you use. For this tutorial, a 32-bit installation image of the Cinnamon edition was used. If your computer is running a self-installed copy of Windows 7, the default number of partitions will be just like the ones shown in the image below. Keep in mind that the partitions on an OEM (Original Equipment Manufacturer) installation could be different. For this tutorial, the operating assumption is that you computer is running a self-installed copy of Windows 7. Note: On your computer, make a mental note of the amount of free space on the C drive listed on this image. You will need the information during the installation of Linux Mint 13. The objective here is to install Linux Mint 13 on the same hard drive, with GRUB, Linux Mint’s boot loader, installed in the boot partition (of Linux Mint), leaving Windows 7’s boot programs in the hard drive’s Master Boot Record (MBR) untouched. Then using another application to add an entry for Linux Mint 13 in Windows 7’s boot menu, so that at boot time, you will be able to choose which operating system to boot into. 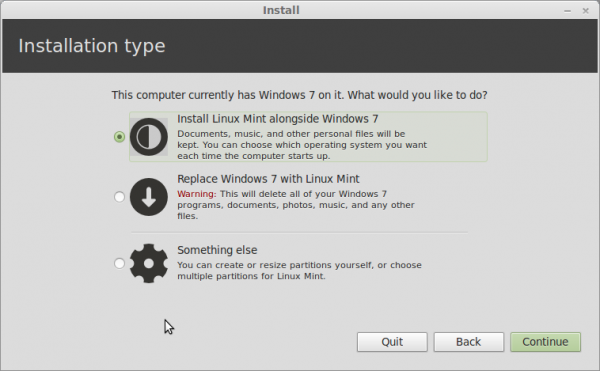 Selecting Windows 7 will cause the computer to boot into Windows 7 and selecting Linux Mint 13 will boot the system into your newly installed copy of Linux Mint 13, but not after a brief stop at Linux Mint’s boot menu. 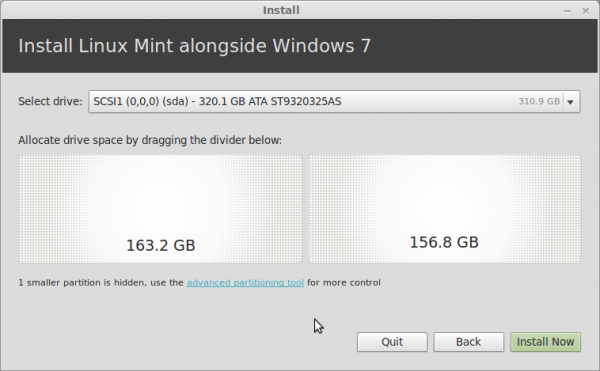 After creating partitions for and installing Linux Mint 13, the new partitions as seen from inside Windows 7 will look a lot different. This image shows the partitions from the computer used for this tutorial after the dual-boot operating has completed. 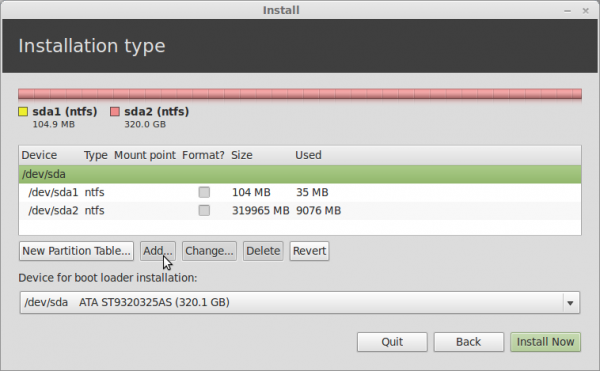 For this tutorial, the partitions that will be created for Linux Mint 13 are: a partition mounted at /boot; root partition mounted at /; a partition mounted at /home; and a Swap partition. You do not need to create all four, but that is what will be done for this tutorial. You, and an Internet-connected computer, needed to read this tutorial. An installation image of Linux Mint 13 (MATE or Cinnamon edition). You may download it from here. Burn the downloaded image to a DVD, or transfer it to a USB flash drive. Note: If you are not familiar with disk partitioning in Linux and how to dual-boot operating systems, it is highly recommended that you read guide to disks and disk partitions in Linux and tips for dual-booting Windows and Linux before continuing with the rest of this tutorial. Now that we have a pretty good idea of what we need to accomplish, time to get it done. To start, boot the computer from the Linux Mint 13 DVD installation image that you made. Linux Mint 13 DVD is a Live DVD and by default, will boot into a Live desktop environment. Click on the installer’s icon on the desktop to start the installation process. When the installer starts, click through the first steps until you get to the one shown below. You definitely do not want to select the second option. Like the second option, selecting the first option will lead to an automatic partitioning of the free space needed to install Linux Mint 13. Selecting the first option will actually bring you to this step, where you can see how the installer will resize the main Windows 7 partition (the C drive). The problem with selecting the first option, is that GRUB will be installed in the MBR of the hard drive, where it will overwrite Windows 7’s boot files. Since this is not what we want to do, the only option left, is the last option (Something else). So, if you are at this step, click the Back button. Selecting Something else and clicking Continue will bring you to the Advanced Partitioning Tool. “Advanced” does not mean that the tool is really advanced, it just means that it is for people who know how to partition disks in Linux. If you read and understood the material discussed in guide to disks and disk partitions in Linux, consider yourself an advanced user. The main window of Advanced Partitioning Tool is shown below. By default, the partitions listed at this step – sda1 and sda2, are the two Windows 7 partition that we saw on the first image on this page. In Windows’ parlance, sda2 is the C drive, while sda1 is the System Reserved partition. 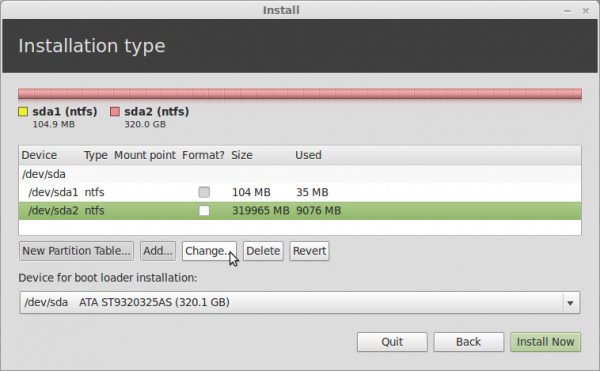 The task here is to resize sda2, freeing up enough space that will be used to create the partitions for installing Linux Mint 13. To begin, select sda2 and click Change. This is the resize window, also known as the Edit Partition window. The sda2 on the computer used for this tutorial has about 320 GB of disk space. How much of that disk space we can free up depends, of course, on what is available. This is where you have to be very careful. The system used for this tutorial was a recent installation, so Windows 7 has only used about 7 GB. With that, I decided to allocate 100 GB to Windows. 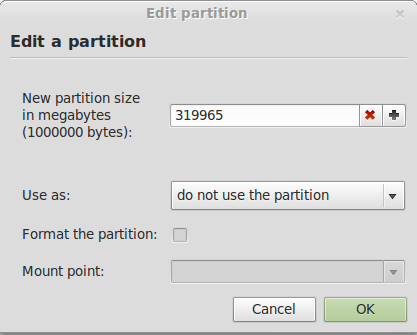 That amount is what should be shown in the New partition size field. And that is all you need to do here. Click OK. I just installed a dual boot of Linux 13 Maya and Win7 Pro on an IBM R51 laptop (an antique). I followed the tutorial as exactly as I could and it works! I am amazed at how clear and precise the tutorial is. It is excellent! Thanks for the comment, but an IBM R51? That’s a dinosaur! It works! It works! After several trials and hours in reading and testing finally I do installed it correctly with working bootloader! Thank so so much for the tutorial! 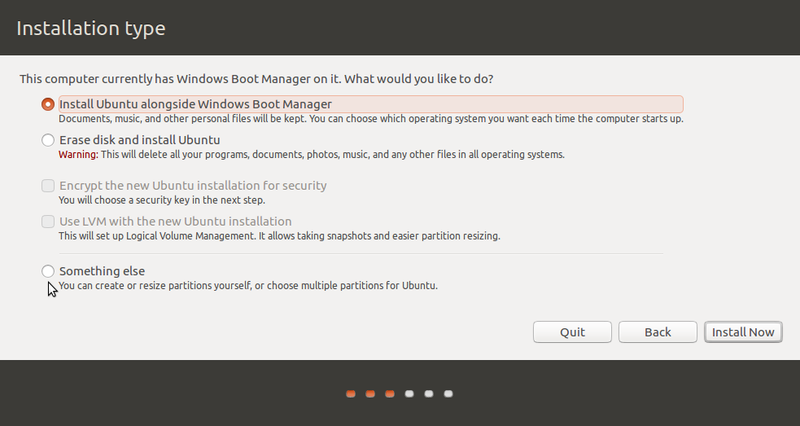 However now when I choose the linux distribution in the bootloader it loads the Grub bootloder I have to choose again. How I can remove one of the loaders and have only one? Thank you very very much again! From Mint, open a treminal and type sudoedit /etc/default/grub. In the upper part of the file, look for the GRUB_TIMEOUT=10 line. Change it to GRUB_TIMEOUT=0. Close the file properly, then type update-grub. That should do it. One of the best tutorials I have even read. The result was a seamless installation. I even turned off UEFI in BIOS too. Linux lists but the computer will not find it nor boot. Also, easy BCDEdit lists up to ext3. The version of linux Mint 13, 64 bit, KDE uses ext4. Using WUBI.exe and going to install Kbuntu. If it works I should be able to overwrite Kubuntu and replace it with Mint 13. Theoretically all I should have to do is edit the bootloader in Windows and everything should work fine. If not, I am screwed. Getting a new SSD drive for christmas and wanted to dual boot win7 and Mint 13. So, the only other ways to do it is to install linux on an external drive and switch at startup, thereby defeating the purpose of dual booting. On another site I read another workaround was to install /boot for linux on a flash drive and the / on the windows drive. 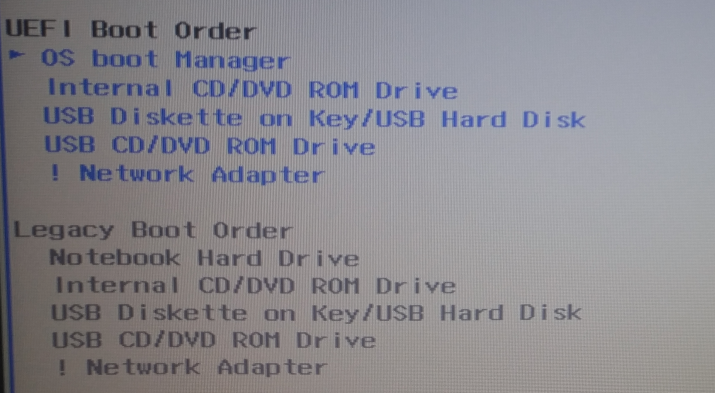 Insert the USB with /boot on it and it should boot into linux on startup. A royal pain that way but might work for people like me. Thanks for the guide, a great resource for those wanting to dual boot and not mess up the mbr. I have run into a problem though. I followed all the steps with some changes (no /swap as I have 8GB RAM so thought I wouldn’t need it and no /home as all files are stored on a nas) and everything worked until I try to boot into Linux Mint 15 and get the Grub prompt. Have I missed something or do I have to do anything to link grub on /boot with the os on / ? EasyBCD was set up as in your guide with the device set to auto detect. Going back in to edit this shows that it is set to look in c:/ but also gives the option of d:/ or boot. Should I change this to boot? My pc has a single 256GB SSD, which I partitioned to 200GB for win7, 500MB for /boot and the remainder for / to install linux mint. Followed this step-by-step and it worked wonderfully. Thanks! Hello, I was wondering if you could help a noob to linux! I followed your guide and everything went well, right up to the point of doing EasyBCD and dual booting. 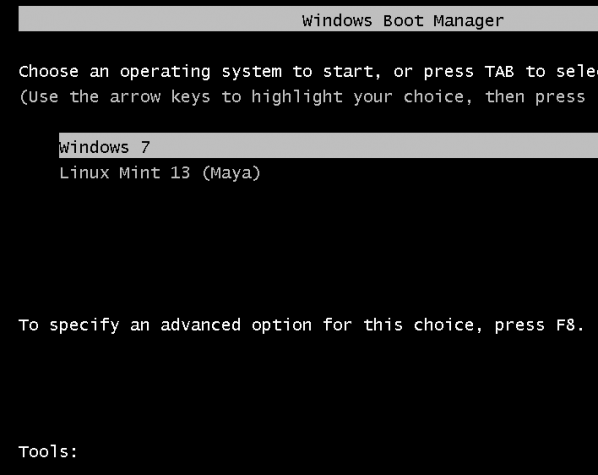 I get the option of Windows 7 or Mint 15, but when I boot to mint 15 I get a Grub command line, and from here I am lost! What could cause this issue? External: Seagate Backup Plus 1tb (which I cleaned, removed all the Seagate software. This left about half the 1tb external “unallocated”. Worked fine, Maya installed. After I then rebooted from the external usb drive, and voila! Maya was there, working fine. 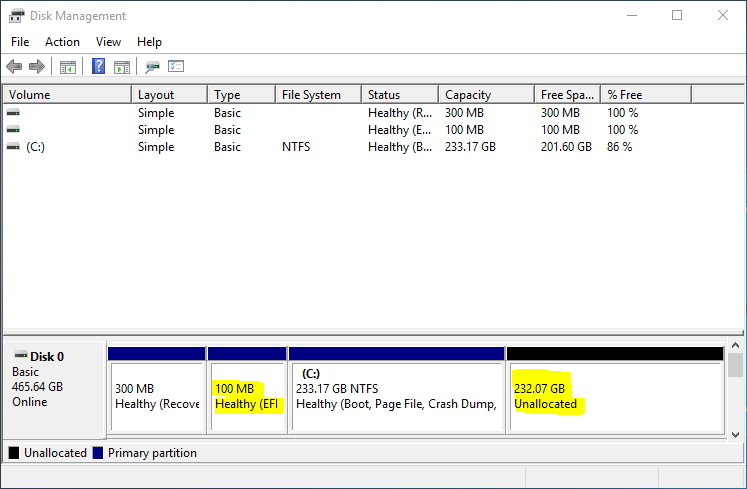 The only step I then needed to add to your fine instructions was to download and used Gparted to change the large unallocated space to “ntfs” so that both drives – the internal Windows and external Mint could both access the external ntfs partition, very handy. You don’t need to use GParted. Mint has a system utility called Disks that you can use for that operation. Search for it in the menu. And note that installing to an external drive is, technically, not dual-booting. My experience has been that it is better to create the common NTFS partition from inside Windows, but if you can create it using Mint’s Disks and it works, then that’s fine too. My Mint 13 doesn’t have a “Disks” utility via the menu search, so I was forced to download Gparted and it can partition and define both drives (internal and external) easily. Although I can use the Window’s partitioning tools from the Win 7 enviroment, I found that Gparted used from a linux boot to be much easier for manipulating all drives. As far as the “true” or “technical” definition you propose, with “dual booting” meaning only from a single drive, although I’m aware some of us use that informal definition, I’ve seen just as many who do not. The more general definition seems to be being able to boot to one of two OS’s (the “dual” part), not simultaneously, from the same machine (whether from the same drive or not). On a single drive the choice is made from the MBR, on a dual drive setup the choice is make through the F12 (or equivalent) menu. Much ado… but would ask why you prefer the NTFS partition on the Window’s drive in my situation (two drives)? Actually, I plan to create another NTFS in the internal (Windows) drive, so that I will have an empty NTFS partition on both drives. This way I can backup the Windows internal to the Linux Mint external and vice versa, on the theory that both drives are highly unlikely to fail simultaneously (tho anything is possible). 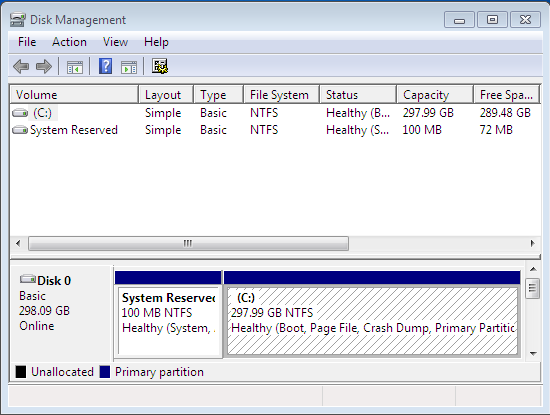 The NTFS partition does not have to be on the Windows drive. I just said it is better to create it using the Windows partitioning tool, because the last few times I created one from a Linux distribution, Windows could not write to it. If an external drive is involved in this type of setup, then I wouldn’t consider it dual-booting. That’s the other point I’m trying to make. 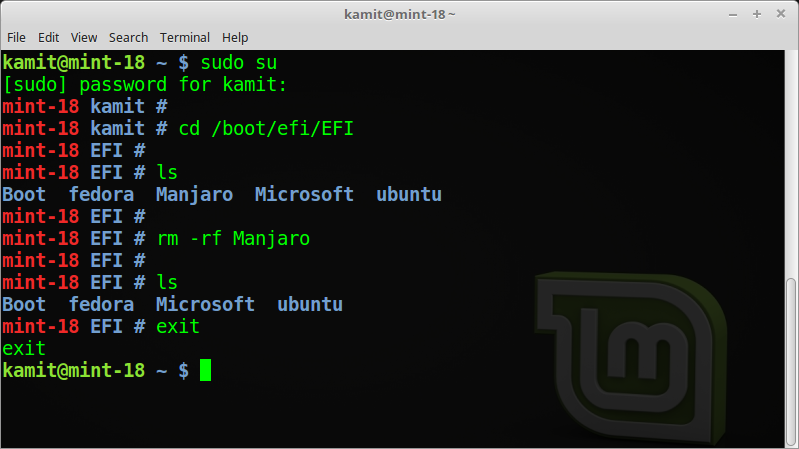 I modified these great instructions to install Mint 13 on a USB external drive. Since my laptop internal is 500gb, and the external is 1tb, I decided to install Mint 13 on the external as a dual boot using F12, but keeping both OS’s and drives entirely separate, save for a shared NTFS partition on the external. Before starting I made sure the drive was clean and formatted for Windows, and connected to my laptop. Booted from a Mint 13 iso in DVD drive, connected to internet and started “install”, then “something else” and went into Advanced Partition. First task: highlighted external drive (sdb for me) then deleted all existing partitions to end up with one big “free space”. I then followed the instructions to add boot (500mb), root (20gb), home (half the remaining free space)and swap (4gb) partitions, I was made sure grub boot would be installed to the external (sdb), then installed. After all was done I rebooted from the internal Windows, and then using F12 from the external to make sure both worked. Grub was on the external as intended. Only issue: Although the Linux boot was able to “see” the internal Windows drive, the Windows boot could not see the “free space”. I then booted in Linux, installed Gparted and took a look: the remaining external free space showed as “unallocated” so I then changed it to a primary “ntfs” partition. Excellent – worked first time. Thanks!